When researching my recent post build self confidence, I came across other articles and blogs on this theme. But as I discussed in my post, some of the tips and steps suggested elsewhere are somewhat dubious. I think the last item is somewhat ironic as by studying self confidence you will have to wade through a swamp of contradictory advice! You’ll most likely end up confused rather than more confident. 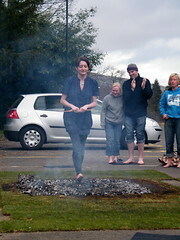 As ever, amongst the bizarre ideas – fire walking, camping in the desert! – comes an odd gem. Building skills is often overlooked. However, as a foundation for great self confidence there is nothing better. We tend to forget we have many skills. As a child we learn to walk and talk. We start to dress ourselves and communicate more meaningfully. Once we start school it becomes an uphill slog – as soon as we learn to write we have to start sitting tests and exams. I have three daughters in their early twenties who seem to have been doing nothing but exams for as long as I can remember! But we learn skills. Unfortunately we seldom give ourselves credit for what we can do. As part of my reflection in my daily journal, I reinforce to myself how skilled and how wonderful I am. No one but me reads this, so I can (and should) be as boastful as I like. With low self esteem and/or self confidence there is a tendency to downplay our achievements – so make them shine here. Increase your skill set regularly. Every year you should at least have acquired a new skill. With a powerful skill-set under your belt, you will be confident in your ability to get things done. You’ll have more experience and you’ll gain more confidence in your ability to deal with different life situations. For the past three months I have been learning mindfulness – which is in itself a skill which can help self confidence. If you are interested I can strongly recommend the site I have been using to learn from Get Some Headspace. You can try it out for ten sessions for free. I will write more about mindfulness in a later post. As Jerry Seinfeld said about reservations, ” its not about making a reservation , its the holding a reservation that makes it a reservation.” So its not about making confidence by having a skill , its the having the confidence to get people to pay me for my skill that gives me confidence which is why I am poor and have no confidence.